Anyone good at identifying ladybirds? I’ve sent this photo off to the Harlequin survey site, hoping they’ll identify it for us. We have a dramatic influx of ladybirds on the cardoons. They are very busy, setting up home, reproducing, laying eggs, eating, generally marching about, arguing with the aphids and rarely stay still long enough for the man with the macro lens to get a clear shot let alone measure them! We think they could be Harlequins but only read up about ladybirds and their lifecycle yesterday. We are watching out for the larvae to hatch now…. 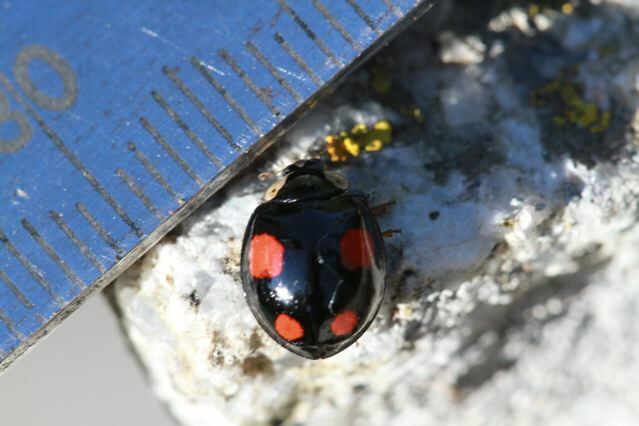 They arrived in Britain in 2004 and are marching westwards, no ordinary ladybird, bigger and meaner than our native species. I usually pay more attention to birds, like the collared doves who are so successful here, and the rose-ringed parrakeets and the little egrets who now inhabit parks and wetlands respectively. But not usually my garden! The world is in flux constantly and the insect world is no exception…. So the question is, should I be grateful that in three days time their larvae will hatch and proceed to devour all aphids, butterfly eggs and everything else that stands in their path, or should I remove their eggs from the leaves and use dilute soap to wash away the aphids? It’s National Insect Week next week apparently, so I’d love to hear what’s crawling and buzzing around where you live! 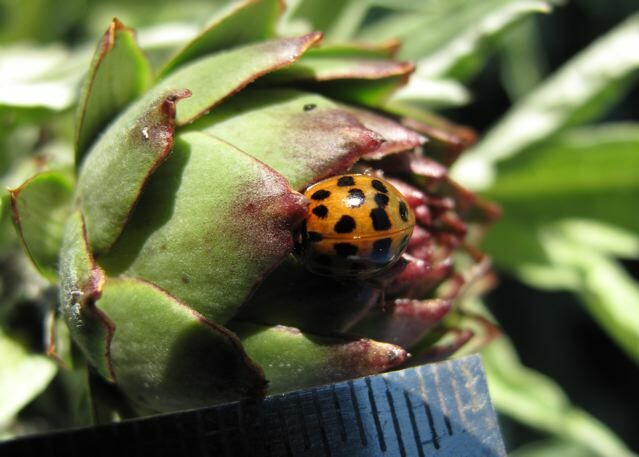 This entry was posted in Garden, Wildlife and tagged beetle, garden insect, harlequin ladybird, national insect week on 17/06/2010 by Joanna. As you are interested in bugs (and I would leave those harlequins chomp merrily on the aphids if it were my decision) do you or Brian or your blog friends know what this strange visitor to my garden might be? Found two of them on Sunday canoodling in the same rose …. ah, bless (or maybe not, as the case may be). The last time I discovered something I hadn’t seen before, it turned out they were Japanese beetles (zillions of them) and they did a real hatchet job on the grass on an impressive scale …. Blue, I have only just become a teeny bit interested in bugs. That is an amazing shot and I have no idea AT ALL what it is! Looks a bit like a bee with the furry bits…. Oh Yes! Look ! Found it in our Collins guide to British Wildlife! ‘An extremely hairy beetle with wasp or bee like back, orange/yellow markings on elytra, throax and abdomen buffish brown. Adults seen June to Sept visiting flowers,thistles and thymes. Mostly associated in upland areas, seldom common, occur in England in North Wales, Northern England and Scotland..
Great photos – Brian’s macro photos are stunning as always! I can’t identify them, but what a brilliant battle picture! That macro lense is sensational! It’s a harlequin. We are plagued by them here in East Anglia. The first year we had a huge influx in October (when they find places to hibernate). We killed them I’m afraid, we must have had about 30,000 (and no I’m not exaggerating!) because they bunched up in the folds of the curtains and in the corners of windows. Oh Celia, look what Annalisa has to say on the subject. Doesn’t sound too good. Curtains full of them. Presumably in October is the flash point if that is when they are looking to hibernate after a busy summer of reproducing and eating their way through the native bugs. Definitely! :) I am going to adopt a wait and see approach to the spotty ones. They may run out of food here and go elsewhere long before the urge to climb inside the soft furnishings. Saw four foxes the other evening in my road…. 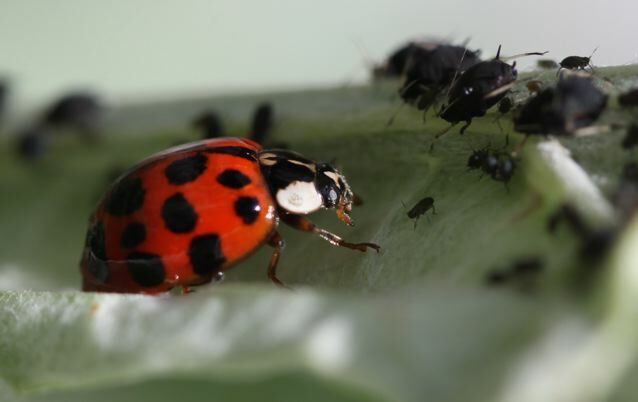 I saw the header and opened this up expecting cakes in the shape of ladybirds….I was expecting some exotic red and black icing and then there was the real thing !!!!!!!!!! Sorry Lynne, did you see Joe’s turtle though? On Dan’s forum, that’s made out of bread! He made it with his niece. They are gathering in numbers today. Some all red ones, more of the black ones with four spots, lots of others with many spots seem to be happy to interbreed…. It’s a bit like the Birds here….. I haven’t seen any larvae yet. Oh and I found a green ladybird type beetle tucked in there with the others as well. Okay enough of the insectophobic ranting. Advice needed: I have a surfeit of oregano sprawling in my mini veg patch. Suggestions? And given that I have eight heads of wheat (thanks to my bird feeder seed dropping onto jasminoides tub on the roof terrace) and five cherries on my patio cherry tree which look they might ripen and not shrivel up and die like the others, do you think I have enough to make a cherry pie for a Borrower? Tutak dear, I promise never to post spider pictures and I will try to limit the insect pictures to cuddly ones associated with childrens’ books, OK? My understanding of Harlequins, was that they were here to stay so no point trying to get rid of them. We saw one on the train the other day – hitched a ride from London? when they want to hibernate in thousands inside your house. Then there might be a conflict of interests. Trains, planes, cars on ferries, there are a lot of ways for wild life to travel these days, aren’t there? Thanks for all your lovely comments Choclette! I do appreciate them!